I was drawn to this book both by the clever title, as well as the reputation of the author, Jane Yolen, who has written many, many excellent children’s book. 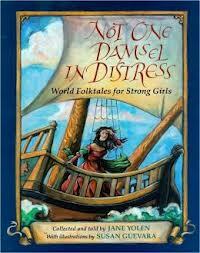 This book is a collection of folk tales where the hero is female. Jane has a wonderful introduction to the book in the form of a letter to her daughters and granddaughters. The book concludes with a letter back from her daughter, pointing out that this book is for boys as well, since they too need to know that women can be heroes. The collection of tales in the book come from all over the world, and some may seem very familiar. Jane does a lovely job of retelling them. I personally find them too grim (?Grimm?) to be told to younger children, but I know that there is a belief that younger children hear tales differently than adults. I’d personally reserve them for ages 9 and up, but I can see that some of the stories in this children’s book correspond well to the Waldorf first grader curriculum. These stories would also be well received if they were told rather than read. That makes this children’s book a great resource for Waldorf teachers who might be looking for new stories to tell. In any case, whatever approach you take, this is a classic set of folk tales worth hearing or reading.